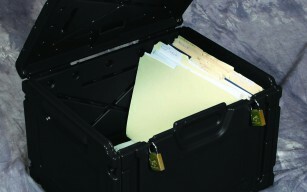 Plastic, Pad-Lockable case for critical or sensitive paper documents. Internal measurements are 15″ x 12″ x 10″ – same as a standard “bankers box”. Designed to be secured with one or two padlocks or security seals. Ships 5 in a master case. Assembles once and does NOT disassemble.